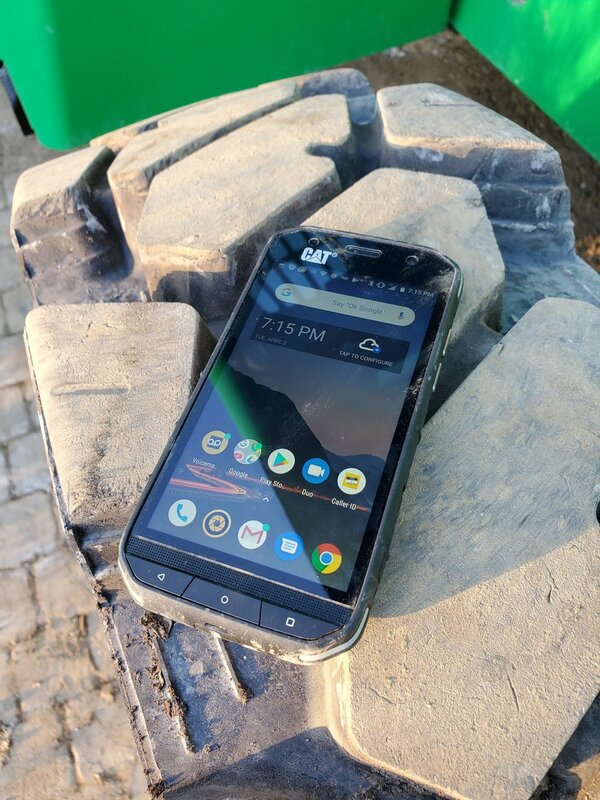 While the CAT S48c doesn’t pack the same feature set as their more premium S61 smartphone (like thermal imaging, laser measuring, and humidity & VOC sensors), it does offer the same rugged exterior that’s built with construction workers specifically in mind. The phone is much thicker than the average smartphone on the market today, but it does not require a case, which evens the field a little bit. All of the buttons on the phone are tangible and prominent, making them easier to press no matter how dirty your hands are or even if you’re wearing gloves. One of those buttons is a dedicated Push-to-talk button on the Sprint Network, as well. Perhaps the most important feature is the S48c’s large battery. At 4,000mAh, the battery is one of the biggest on the market, allowing for up to 30 hours of talk time. Even the brand new Samsung Galaxy S10, which has been lauded for its battery life, only sports a 3,400mAh battery. The Samsung S10+ does offer a 4,100mAh battery, but will take much more power to operate its larger processor and screen. The phone’s IP68 rating makes it water and dust proof, allowing it to be completely submerged under 4 feet of water for 35 minutes. The charging port, headphone jack, sim card slot, and micro-SD memory card slot are all outfitted with rubberized covers to keep dust and water out. It also features a front facing speaker, which I found to be much louder than my Samsung Galaxy S7, making it more conducive to being used a loud jobsite. The big draw for construction workers using this phone is its overall ruggedness and huge battery. The specs list the S48c as able to withstand repeated drops onto concrete of up to 6 feet. I was able to test that claim during my time with the phone and made a quick video of it, which you can watch below. Dropping a phone repeatedly is not something that I thought I could ever do comfortably, but the S48c feels so substantial I wasn’t super worried about it. Other than a few minor scuffs, the phone still looks to be in perfect condition. The battery life was as advertised as well, I was easily able to make it through an entire day without needing to charge it. In my experience with smartphones, though, I don’t start having battery issues until the end of my first year and I was not able to use the phone for long enough to determine whether or not that battery life was sustainable. Other than the ruggedness and battery, the performance specs on the phone are a bit run-of-the-mill, but this phone is not meant for the extremely tech heavy user. The camera was adequate, as well, but it will struggle more than a premium phone in low light conditions. Built-in memory could be an issue for some, as the phone comes with 32GB of storage, but 17GB of that is used up by the operating system and other built-in apps straight out of the box. As mentioned in the features, though, the phone does have a mirco-SD slot for expandable memory, if extra space is needed. As I’ve touched on above, the S48c is not meant as a premium feature-packed smartphone and it’s not priced as one, either. On the Sprint network, it retails for only $480, but on Verizon, it retails for $600. At least on Sprint, it’s about half the cost of the latest and greatest iPhone or Samsung Galaxy device, especially when buying a rugged case is added into the equation. For those of you who constantly crack your screens, CAT phones also offer a free screen warranty, so getting your screen fixed won’t cost you a penny. Taking into consideration the S48c’s overall cost, ruggedness, memory, processor, and battery life, the CAT S48c is best suited for those that spend a lot of time on-site, who also do not need to run a lot of phone applications. The phone will provide them all day runtime, quick access to Push-to-Talk, and the peace of mind that they can bring their phone on a jobsite without constant fear they’ll crack their phone or submerge it in water.